I asked the angel who talked with me, “What are these, my lord?” He answered, “Do you not know what these are?” “No, my lord,” I replied. A solemn reminder from the Word of God to Zechariah . Zehariah was a prophet of God to the rebellious and haughty chosen nation of Israel. This would be Zechariah’s fourth of eight visions that God would give him, and really as far as interpretation the easiest to understand. 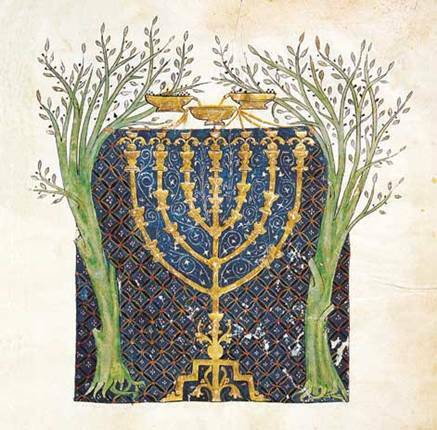 The main focus this 4th vision to him is seven branched golden candlestick and two olive trees, one on each side of it. The golden candlestick , can be traced back in Scripture to the tabernacle in the wilderness. The branched golden candlestick typified the word of God by virtue of its being the only light in the sanctuary representing both Israels of God. It would symbolize what was yet to come. The teaching was that the Golden Candlestick would be supplied with oil from the two olive trees that were set across from each other. The thought is that the Golden Candlesticks were supplied the oil to keep burning without the help of any man to pour in the oil, and trim the lamps. The Second thought is that the temple should be built by Zerubbabel, not by the strength of men, but through the Spirit of God. Zechariah’s vision adds a significant detail about the two olive trees; the olive trees, which stand for the Old and the New Testaments. The first six words of the angel’s explanation contain the whole explanation: THIS IS THE WORD OF JEHOVAH! When God is in a project, there should always be a checkpoint through determined prayer to make sure that we heard it from God first, and last. Really, the credibility of anything we do unto the Lord needs to be prayed and searched in the Scriptures. This serves as a warning of God through the prophet Zerubbabel , that the political and assets he possessed would have nothing to do with his success. It would God’s power that would be sufficient to accomplish His plan. It seems strange that we use God’s resources and some times work through a plan, even praying over it, and at the completion of the project see more evidence of our hands in it than God’s. This should serve as a warning to us today that when we do things in the name of the Lord in our own strength, our own twist on God’s wisdom, we miss the mark, and produce an inferior result compared to what God could have done through us. Instead of making plans and outlines, how about taking the ‘thought into captivity’ and harness it in prayer. Wait and watch how God’s plan will bud and produce fruit without any help from you or I. Maybe today you’re doing the work of the ministry but something seems to be missing. The fruit is small, the anointing is missing, ask God to reveal to you what it is that needs fixing. He desires that you be filled with His Spirit, with power! Call Him! If your getting ministered to from these blogs, drop me a comment, what you liked, what challenges you to walk closer to Him. Also, this site has a Prayer Request page, won’t you add your prayer requests today? Prev What Is Going To Happen Next?